Steven Spielberg, Meryl Streep, and Tom Hanks deliver a timely message. Tom Hanks and Meryl Streep have deadline jitters in The Post. 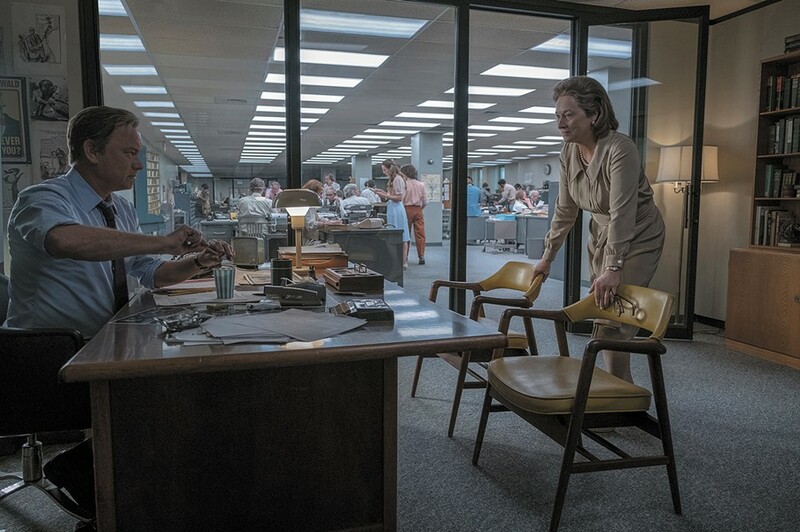 Steven Spielberg, Meryl Streep, and Tom Hanks reportedly cleared their production schedules in order to make The Post for release this holiday season. Their historical dramatization tells the story of how The Washington Post defied the Nixon administration to publish the full Pentagon Papers in 1971 — thus exposing decades of government lies about this country's involvement in the Vietnam conflict, going back to the 1940s. It's a story worth retelling every few years, lest we forget. Among the things we'd be likely to misremember about that era is the tremendous power of newspapers to shape public policy, in addition to bringing news to a mass audience in the days before the internet and cable TV. As craftily explained by director Spielberg and screenwriters Liz Hannah and Josh Singer, Post editor Ben Bradlee (Hanks) and his boss, publisher Katharine Graham (Streep), have numerous conflicts of interest that could dissuade them from disobeying the Nixon White House ban on publishing the voluminous secret files — stolen from the Defense Department by former staffer Daniel Ellsberg (Matthew Rhys) — on American political and military skullduggery in Southeast Asia. Bradlee would like to take it easy on the legacy of his old friend, the late President John F. Kennedy. Washington socialite Graham, meanwhile, counts as one of her dearest pals former Secretary of Defense Robert McNamara (Bruce Greenwood), one of the principal architects of the U.S. policy of "containment" of the "communist threat." Those were different days. Streep and Hanks take hold of the drawing-room dynamics and give it the full Spielberg, laden with irony and heavy with significance. The Post helped drive Nixon out of office. The idea that "we did it before and we can do it again" rings loud and clear. But can we? Directed by Steven Spielberg. With Meryl Streep and Tom Hanks. Opens Friday.